I didn’t get into the Communication field because I’m a numbers person. Words are my tools, not pixels or bytes or zeros and ones. Pie charts are interesting – when someone else explains them. Even spreadsheets make me uneasy. I’d rather write a narrative. But the Ford Foundation’s Change By Design conference I attended in New York City in late June may well have been a game-changer for me. For the first time I could really see how facts and figures – when put into the hands of designers, researchers, artists and statisticians– can pack a dramatic punch large enough to have a room full of foundation veterans oohhing and aahhing. The event featured leaders in the fields of design, social innovation, art, and journalism, all of whom are thinking creatively about digital storytelling. During the day-long event presenters shared case studies on topics ranging from experiential data visualization to data for news reporting to collaborative mapping. It was a day of inspiration more than it was a day of skill-building. It was a profound shift in your thinking kind of day. I left feeling like I’d seen the future of social change. And the future, let me just say, is information design. Below are some highlights. For more details and video, you can go here and here, and you can also take a look at #changebydesign. Wherever possible I linked the name of the presenter with his or her Twitter feed. In most cases they are chock-full of the “what’s next” of our profession. Jake Barton, the founder and principal of Local Projects kicked the event off by sharing visionary examples from his work with the 9/11 Memorial and Museum, the Lumiere project at the Jacob Burns Film Center and from PlanNYC2012, which eventually led to the adorably inspiring @bronxchicks project. (Check the feed out is all I will say.) In all of these cases he’s pairing written narratives with graphics, photos and data to create “meaningful adjacencies.” Put another way, Local Projects takes big groups of facts and makes them into moving and personal multi media experiences. Amanda Cox, graphics editor at the New York Times, shared an analogy that really resonated for me. “You’d never write a headline that says, here are some words, hope you find something interesting,’ she said, “nor should you do that with data.” Subtracting and adding information, scaling patterns and giving context are some of the ways the Times brings data stories to light through graphics. Follow @nytgraphics for a steady feed of examples. Jer Thorp, data artist in residence at the New York Times, is the founder of blprnt.com, where his “digital art practice explores the many-folded boundaries between science, data, art, and culture.” In other words, he’s on the cutting edge of wow. His work is based on the idea of an exploratory tool, or “cascade” that shows how social media stories get passed on. Thorp is also the creator of openpaths.cc a site that – get this – lets us recapture our own data from our phones and computers, and voluntarily share it with researchers. It’s an “outward facing utility that lets people look at their own data story.” Being able to reclaim data from the hands of third-party providers means that researchers, many of whom are working on social change, can have access to the data that can power their findings. As a very cool example, he showed us the exact timestamp and geo-coordinates of the moment he met his girlfriend – data points harvested from his iPhone. Laura Kirgan, co-director of the Spatial Information Design Lab at Columbia University, and Leah Meisterline, co-founder of PRE-Office, provided us the latest on cartography as a powerful tool for engagement. Kirgan discussed the project, Million Dollar Block, which uses criminal justice information to collect, analyze and propose solutions for highly regressive, high concentration crime areas. Foundations interested in communications for criminal advocacy and urban rehabilitation will want to look at her work. Leah Meisterlin shared the story of using “extreme mapping” to both highlight the problematic aspects of a purely mathematical plan to restore New Orleans and propose meaningful, data-backed solutions. Foundations interested in using communications for urban renewal as well as anyone hoping to use infometrics to disprove outdated models should check out leahmesiterlin.com. Rosten Woo, the third member of the “Collaborative Mapping” panel was my personal favorite because he offered hope for the rest of us by sharing his belief that “you can do data visualization with excel and an iron-on decal.” His work in urban pedagogy takes complex regulations and data sets and makes them easy to understand using print, sculptural and yes, iron-on decal forms. See his simple, elegant communication solutions at wehavenoart.net. Now it’s your turn: Whether your point of entry on “design for good” is how to use infographics to present your social media metrics to your stakeholders, or how to partner with program officers to gather, visualize, disseminate and leverage their grantee data, we want to be a part of the conversation. 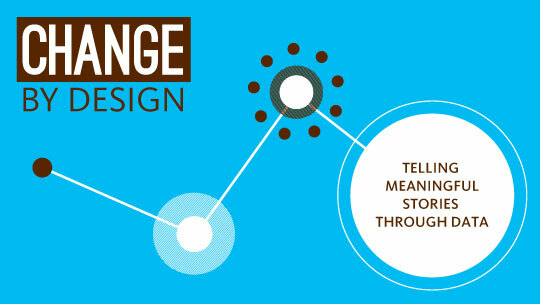 What’s your information design story?